West Salem Post 51 American Legion offers a variety of meals in the dining hall multiple times a month. The food provided each month varies. On the second and fourth Fridays of each month Berg-Hemker-Olson Post 51 hosts Good Food Fridays. Good Food Friday offers a variety of food choices from sandwiches to full meals. All meals include french fries, a salad bar, and coffee or milk. Drinks are also available upfront at the bar. In addition to Good Food Fridays, Post 51 also hosts Monday night meals, Wednesday lunch meals, and multiple special meals shown on the calendar. One special meal hosted by post 51 each month is a baseball fundraiser meal. Baseball fundraiser meals are commonly held on the last Saturday of each month; with all proceeds going towards improving Post 51 baseball. West Salem Post 51 also has an open bar. The bar at Berg-Hemker-Olson Post 51 American Legion is open from 5:30 PM to close each and every Friday night. The Dining Hall is also available for rental when not in use. Food is catered by Post 51. You may prepare and bring your own food but you are assuming all responsibility for it. 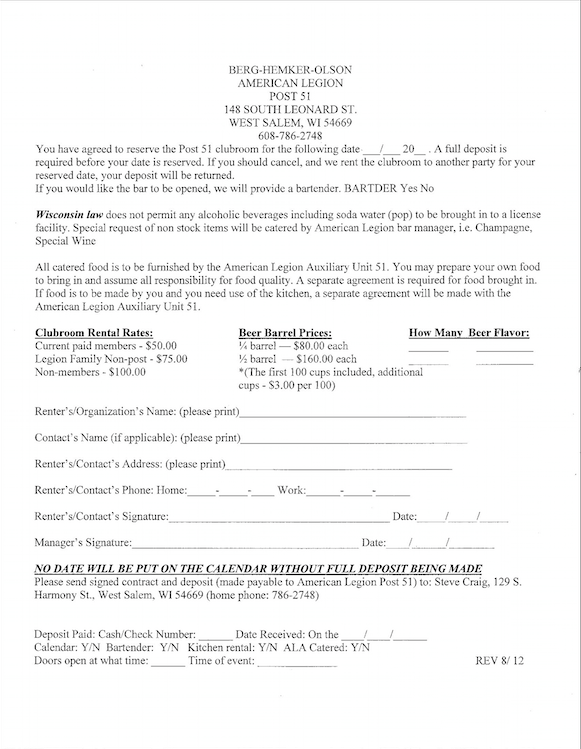 If you are interested in renting the Dining Hall/ Clubroom click here for a rental form.